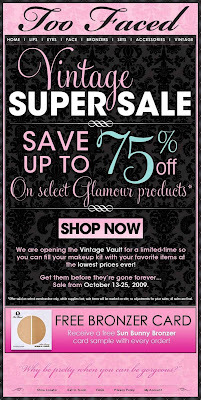 Online Sale Alert: Too Faced Beauty Vintage Super Sale | Fashion. Style. Beauty. | Life is short. Live well. Hey, beauty fans: genius makeup brand Too Faced Cosmetics just dropped me a line to let you know that they’re having a fabulous sale from now through the 25th of October! They’re opening the Vintage Vault and offering up to 75% OFF some of you time-tested favorites. I hopped over to the site to check it out and it looks amazing. I mean, let’s get real: the glamorous Too Faced Loves Kipling Glamour Eyes collection is now $15, down from $67! Kitty Glitter Vintage is just $4, down from $12.50! At these prices, these items will be going, going, GONE so get cracking and head to the Too Faced website to get your shop on!